Beetroot, Cabbage, Carrot, Swiss Chard, Lettuce, Strawberry and Tomato. 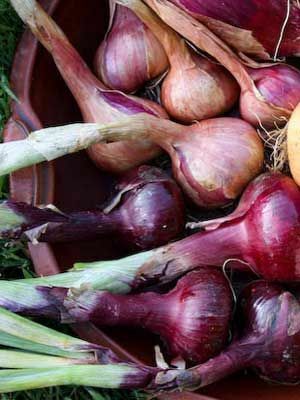 Easiest to sow onion sets (tiny bulbs) which are planted direct into the soil from autumn/fall onwards. Can also be grown from seed in which case start in pots under cover in late winter before planting out mid-late spring. Japanese variety onion sets can be used to give an early harvest. Onion sets are also the better choice for heavier or wetter soils. Harvest as soon as they reach a reasonable size. If storing them, wait until the tops start to die down and dry for about 10 days.